Once you know what emergency bag / kit(s) you need for your family (if you haven’t done that yet, read this post: Which emergency bag do you really need? ), the next step is to decide what to put into each bag. This is easier said than done and it is best to put some real thought into this process. You want the bag(s) you put together to be truly useful when / if you need to use them. A lot of websites will simply provide you with a checklist of items you should have in your bag. 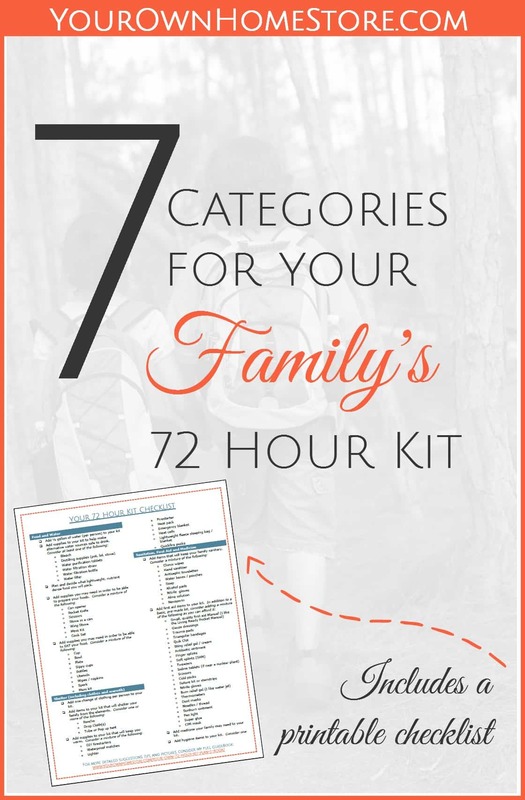 I’d like to suggest using these seven 72 hour kit categories instead. In addition to giving you a list of suggestion so what you might include, I’m going to give you a set of categories you should consider for your emergency bags. 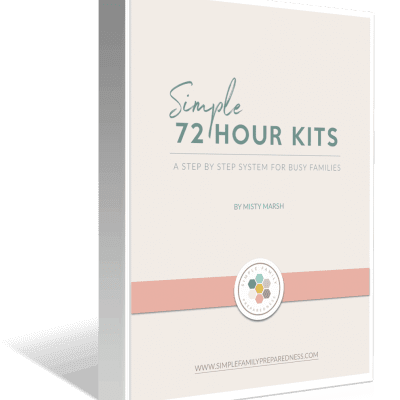 Back when I first started working on e-prep, I had a very basic 72 hour kit that I had bought somewhere (I can’t even remember where) pre-made. It sat in our closet and gathered dust. To be honest, I didn’t even really know what was in it. I’m not even sure if I’d ever opened it and looked. It certainly wasn’t personalized for our family. I started looking through various checklists on different websites and while helpful for brainstorming, all the checklists I found had either too much stuff, too little stuff, stuff I didn’t know how to use, or stuff I didn’t think I’d ever need. Many were also missing things that were important to our family. The checklists just weren’t working for me! I decided to focus on categories for my 72 hour kit instead. This allowed me to actually think about what my family might need from that category instead of what someone else said I might need. I still used the checklists to generate ideas, but my kit became a mixture of a whole bunch of lists plus my own thoughts and ideas. Eventually I came up with 26 72 hour kit categories and spent 6 months (26 weeks) working on building my kit. I shared what I was doing with my readers on my blog each week and that series was very well received on my blog. In fact, I turned the whole series into an e-book. Today, I would like to provide you with a basic outline of that series! I’ve combined some of my 26 categories (for example I combined food and water into one category) to come up with seven main areas you should consider when creating an emergency kit for your family. But remember, there will be some things on my list that you may not want or need in your kit(s). There may also be things your family would want / need that I don’t have on my list. Take the suggestions from my list as well as your own ideas as I walk you through each category below and create a customized list of what you want in your kit(s). You may also consider adding things from this list to your overall To Do, To Buy and To Learn Lists. Don’t stress about getting / buying everything on your list all at once. That would be expensive and stressful. For now, just create a list of what you need. Once you have a checklist of what you need for your family’s kit(s), you can then gather items you already have around the house. For what you don’t yet have, your list will allow you to take better advantage of sales you may run across. Instead of thinking “Do I really need that?“, you will know. You will also better know what to look for a yard sale / thrift store. Just knowing what you need is half the battle! Once you know what you need, you can begin to gather it little by little. Recently, I showed you how my 72 hour kit go-bag also serves as my car kit, 72 hour kit home kit, get home bag and office kit. Remember to consider this as you build your family’s kit(s). If you can keep your 72 hour go-bag in your car, it may be able to serve as a get home bag for you too. You may not need to buy as many supplies for your car kit. Don’t buy or pack more than you have to! 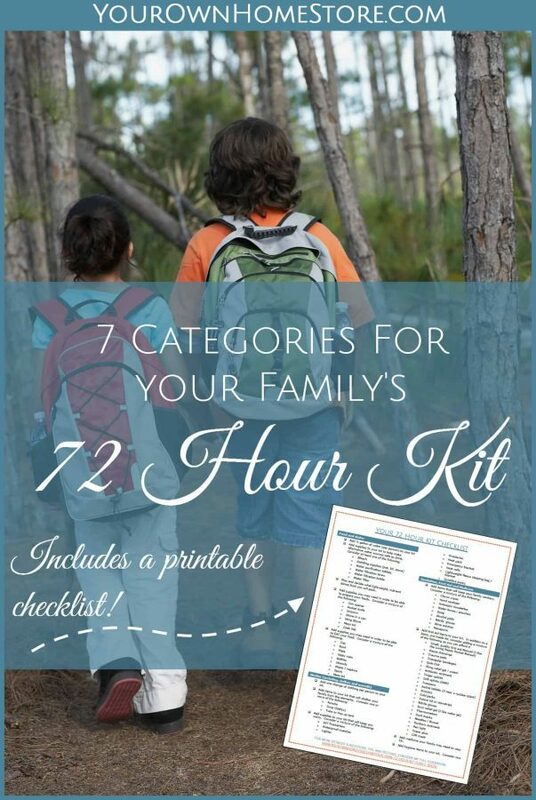 While most emergency bags should included something from the following seven 72 hour kit categories, there are some emergency bags / kits that are a bit more unique and I would like to give you some additional resources for them. A car kit should have all of the following seven categories, but it should also have things that are specific to need you may have in a car such as tools to fix a flat or jumper cables. You can find more details on what to include in a car kit here: Emergency Car Kit. An EDC (every day carry) may have all seven categories, but it has to be small. It will have far less of each of the following categories than an actual go-bag. I have yet to write up a post about my EDC, but Jane from Mom with a Prep has a great post about her’s here: Mom’s EDC. An emergency kit that you send with your kids to school will likely have all seven categories, but it also deserves some unique attention b/c kids have unique needs. I will likely write a post about mine in September when I update it, but for now, here is another post from Jane from Mom With a Prep (I really like her stuff): How to Make An Emergency Survival Kit for Kids at School. A First Aid Kit doesn’t include the following seven categories. Here is more information on first aid kits. 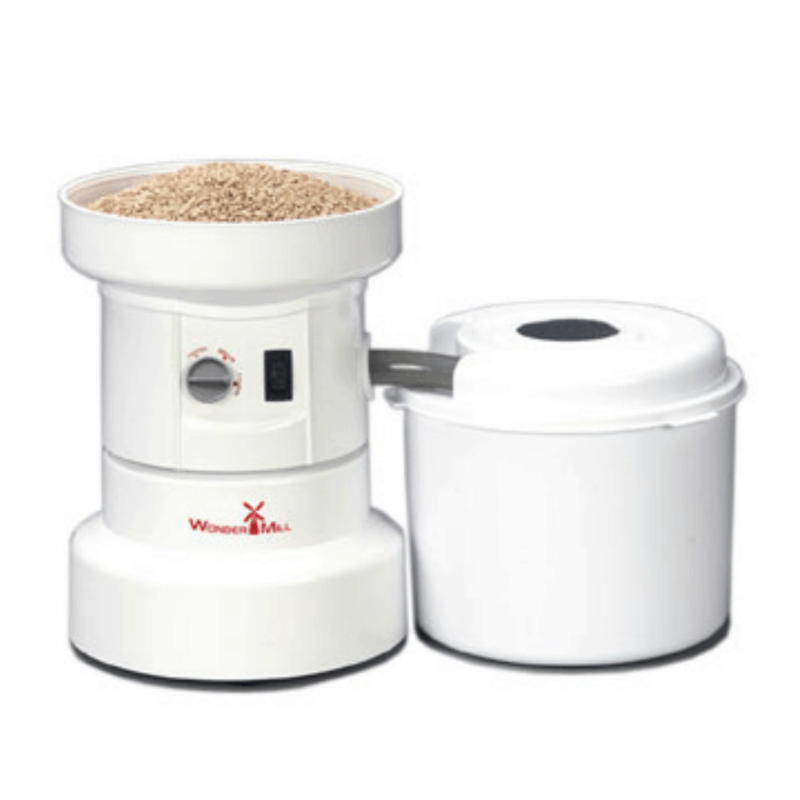 A home kit could include more extensive types of food that require cooking if you have powerless cooking tools such as a butane stove or HERC oven.. However, I still like ideas that are quick and easy for the first few days following a disaster. In a disaster situation, I’m going to want to spend time with my family, not cooking extensive meals. As such, I have a few easy to prepare meals ready to go in my pantry. A go-bag of any sort (something you are planning to carry) should have food that is lightweight, easy to prepare and high in calories. If you are having to carry it, you will want to avoid heavy cans and pots. If you are trying to get somewhere quickly you won’t want to take much time to prepare your food. And when you go to pack your kit, you may find you don’t have room for plates and forks and such. Consider ideas similar to these: An Ideal 72 Hour Food Kit. If you do include food that needs to be prepared in your go-bags, make sure you include any pots, pan, utensils, stoves etc that are will be needed in order to eat it. An EDC or car kit will likely get much hotter than a kit in your pantry. Make sure the food you have there doesn’t spoil easily. I keep trail mix in our car, but we rotate it often b/c the nuts go bad so quickly. Water is HEAVY! Put some in your go-bags, but consider carrying items that will help you filter or purify water as well. 72 hour kit category #2: Clothes, Shelter and Warmth. Chances are that sometime in the days following a disaster you will want to change your clothing whether you are at home or evacuated. Consider picking up clothing at the thrift store to put in your kits. Bright, solid colors are smart so your family can find each other. If you are packing your clothing into a go-bag, keep it lightweight. Consider a sweatshirt and sweatpants that would be good for cold weather or could be cut off in warmer weather. Don’t forget underwear and socks! If it even gets relatively cold where you are, make sure you add things to your kit(s) to keep your family warm. Start with the clothing mentioned above, but include, shelter, blankets and things that actually generate heat. Items in a home can obviously be heavier and more robust than items in a go-bag. Shelter may be one area you can skimp on a bit unless you are really planning on hiking across the country for days. If you are home, you may be able to stay there. If your home isn’t liveable, you may be able to use your car. If you have to evacuate, many churches open their doors as shelters in a time of crises. But if you anticipate wanting / needing shelter, you may want to consider a tent (a large robust one could be used in your back yard if you home isn’t liveable). Even a tarp or an emergency blanket and a rope can create a makeshift shelter. Being able to create heat and then stay warm is also important. Have a way to start a fire. Consider emergency blankets (this one is worth the few extra dollars…the cheap mylar ones just rip) and heat packs for go-bags. If someone in your family is injured or hurt, you will need to care for them on your own. Make sure you have items to clean not just bodies (like soap), but wounds (like antiseptic pads and antibiotic ointment). 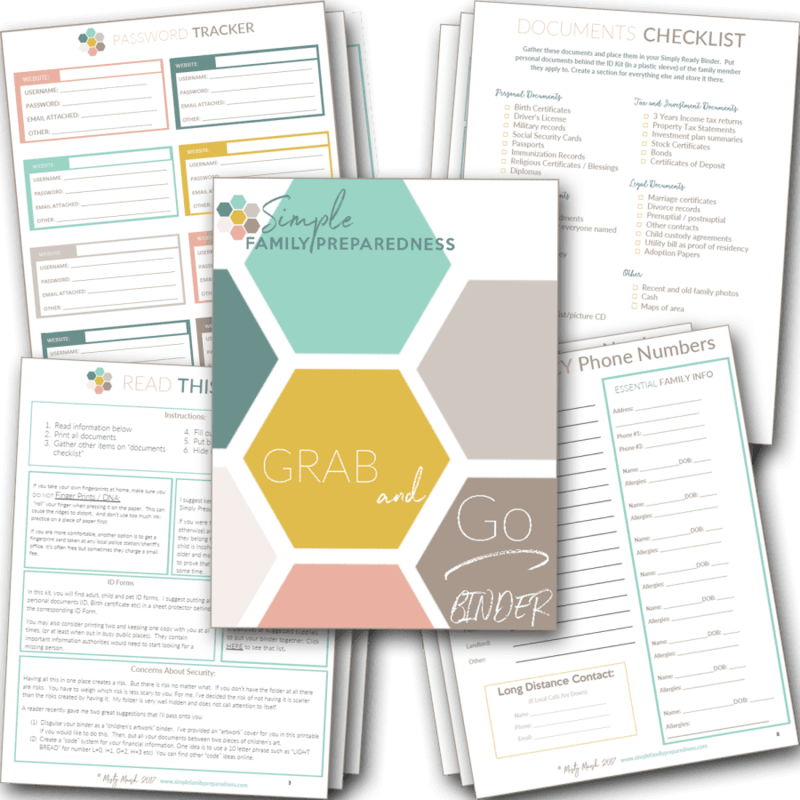 Have ample first aid supplies (find a printable list here: My First Aid Kit Guide), and a first aid book to help you think clearly and know what to do. Also think about what medicines your family might need. If you haven’t yet, make sure you write down any regularly taken medicines and their dosages. Light isn’t essential for life, but it sure does make things a whole lot easier! And it gets dark once a day or so (if you haven’t noticed)…Soooo, you ought to be prepared to provide your own light at night. Consider solar or crank sources in addition to (typically) more powerful battery powered sources. The tools you include in your kit will vary depending on the kit, your needs, your location and what you are preparing for. All your kits should include a AM / FM NOAA weather radio so you can stay up on weather and other news about the disaster. In a go-bag, you might consider communication tools such as whistles or “walkie talkies,” a compass, rope and work gloves (see printable list HERE for more ideas). Your home kit should include shovels, gas shut off tools etc. 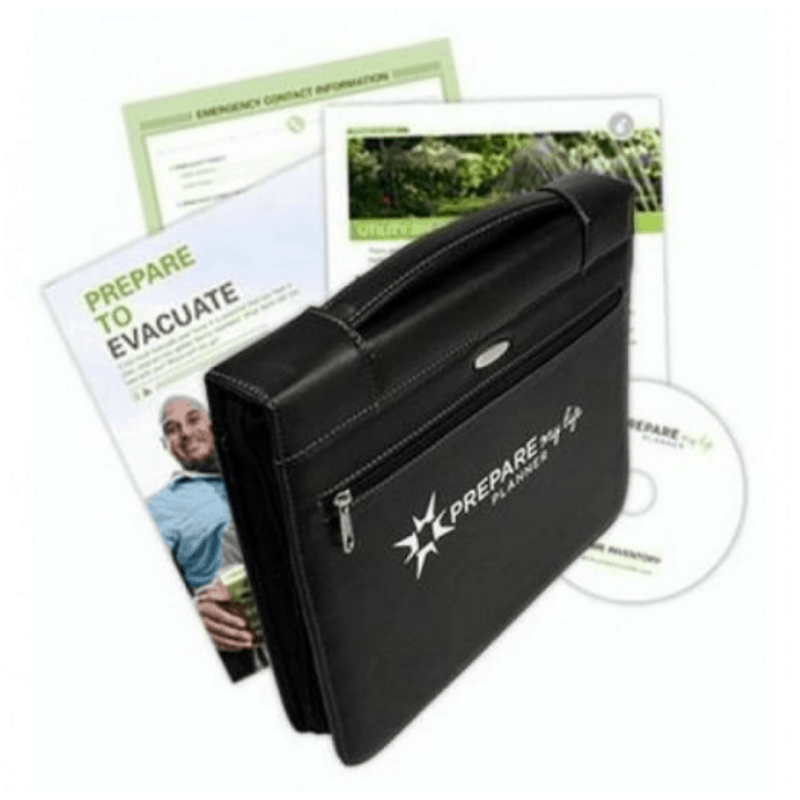 If you haven’t yet, you should great a grab-and-go binder full of your family’s most important documents. Having this in one place comes in handy in day to day life, but it would be essential in an evacuation or disaster situation. 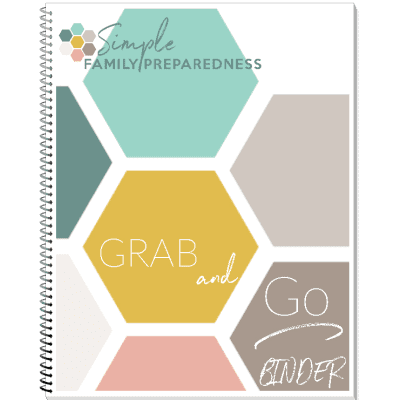 You can find free printables for creating your own binder as well as tips on keeping it safe and secure here: Creating an Important Documents Folder or Grab and Go Binder. Other items that would fit into this category would include cash (credit card machines may not be working), and maps. This is the category that will differ the most from family to family. Are you religious? What religious items would you want with you in time of extreme stress? Do you have children? What unique needs do they have? Do you own pets? How would you care for them? That’s it! Make your list and gather what you already have in your home. Then, over the next few weeks and months, keep an eye out for good deals on the items on your list. Once you have everything gathered, finish up! First, decide how to package everything. I suggest you wait until the end to make this decision, as you won’t really know how much stuff you have until you’ve gathered it all. Last, make a list. I suggest you keep a list of what is in your kit right on the top. In the event that you actually need to use your survival kit in an emergency situation, it is likely that time will be of the essence. You may need to locate a certain first aid supply quickly or get a clean diaper or wipe for your child. 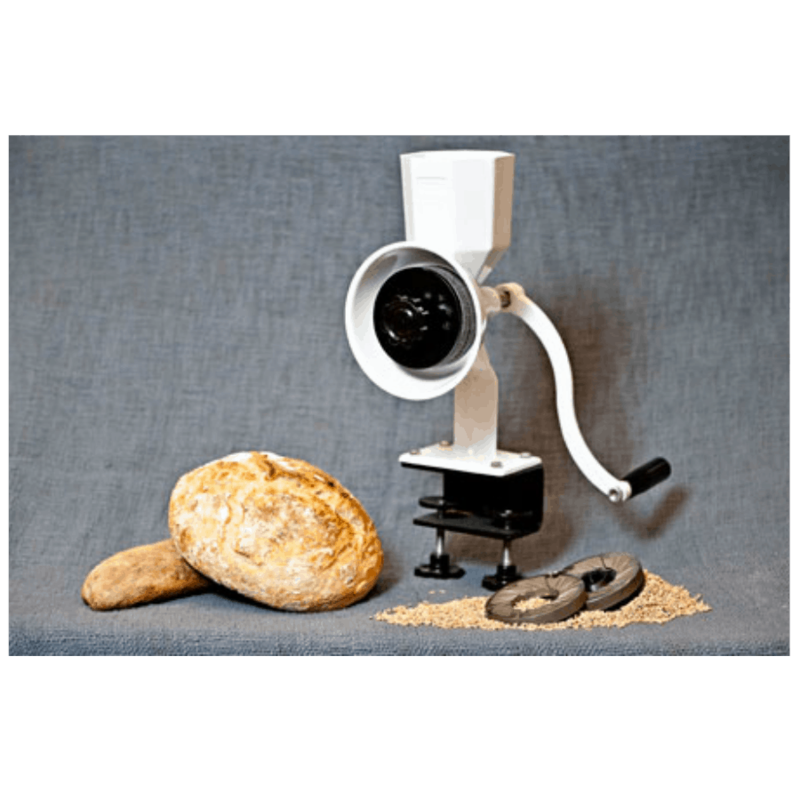 Your family will be hungry and you don’t want to dig through / remove everything in your kit looking for the oatmeal packets you think you included! So make a list and remind yourself which pocket you put the toothbrushes in and where you put the snacks! I’m a single person living in an appointment and it’s hard to find storage here. I keepadding to my bob bag how do i just keep the essentials and not over pack? I now have everything in it including the kitchen sink. My bedroom has now become my storage unit for my gear and suggestions would be appreciated thank you. I am a provident living and emergency pep representative for our ward can I share this. I will encourage them to go to your website. Yes, you are welcome to share it Susan!